U-house outlet plugs are of the highest quality, safety tested, and child secure. Easy to use yet safeguard your home. 1.Practical and parents love- Look for an easy and effective way to prevent baby from touching electrical socket. The plug protector is ideal way keep your baby safe. 2.Easy to install- Simply insert the prongs into the outlet slots, make sure the cover firmly fit the outlet plate. Easily removed by adult but children hard to pull them out. That allow you to have peace of mind while children explore your home. 3.Safety material- This outlet covers made of non-toxic ABS and anti-pull PE strap. Harmless to the human body, extremely fit for domestic use. 4.Thoughtful design- these outlet plug are specially designed and much fit for US' socket, ultra sleek white appearance blends easily with any home decor. Safeguard for Your Baby- Using the plug protector, it's a easy and convenient way to prevent your children/babies/toddlers from touching electric hazards, to make sure keep their safe when you're not stay with them all the time! Safety and Durability - Our outlet plugs are made of durable, safe ABS, you can used them repeatedly. And they are specially designed and much fit for US' socket. By firmly covering unused outlet, effectively help baby away from outlets, prevent electrical shocks dangerous. Easy to Use- These outlet covers are quick to install within a few seconds, simply insert the safety caps in the unused outlets, plug protector will fit firmly in outlet,baby hard to pull them out. 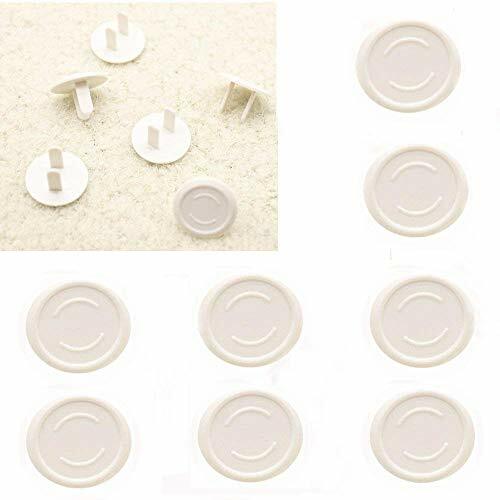 Match Any Decor- These outlet caps are ultra white, gently blending in to your home decor. Keep your home a safer place while doesn't to be an eye sore. Lifetime Refund Guarantee- Value pack with 50 count baby plugs and good quality, if at any time you didn't 100% satisfied, we promise offer a prompt and full refund for you. If you have any questions about this product by U-House, contact us by completing and submitting the form below. If you are looking for a specif part number, please include it with your message.